We will try to refrain from references to early-90’s romantic comedies in this post. And stick to agriculture topics. We like to think that we stay on top of some cutting-edge technologies for small scale, sustainable agriculture. 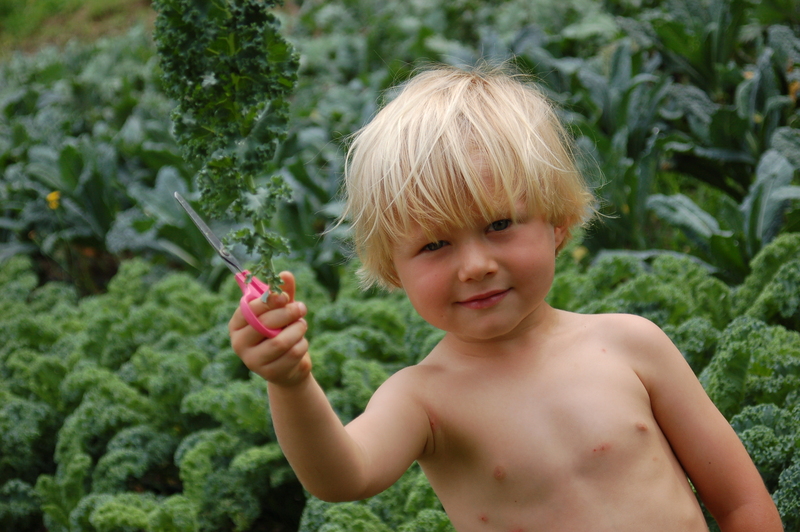 Four-year old boys cutting curly Kale with kids’ scissors isn’t one of them. Last week we showed this picture, which shows Dan grafting a tomato. He experimented with this on his own last year, with glimpses of success. The idea is this: You grow two types of tomatoes from seed: One that is resistant to certain challenges of organic tomato production and one that produces yummy tomatoes. When they are a certain size, you cut each one at matching angles and plunk (graft) the top of the yummy one onto the bottom of the resistant one. They you (in theory) get a strong and resistant plant that produces delicious fruit. Some report increased yields. Easier organic management. Etc. A small clip holds the top and bottom together while they graft onto one another. This is the same idea that plays out in the fruit tree world. He applied to serve as Program Manager for a state-wide research project this year, aimed at seeing if this is a viable and profitable venture for a small, organic farm. (Partner farms: Origins, Fertile Crescent, Potomac Vegetable, Dayspring, and Hardy Family.) It’s been interesting so far, with a lot of…”learning opportunities.” We’ll keep you informed about the progress. The jury is still out on whether this works well on this scale. Then there was this crazy photo last week. 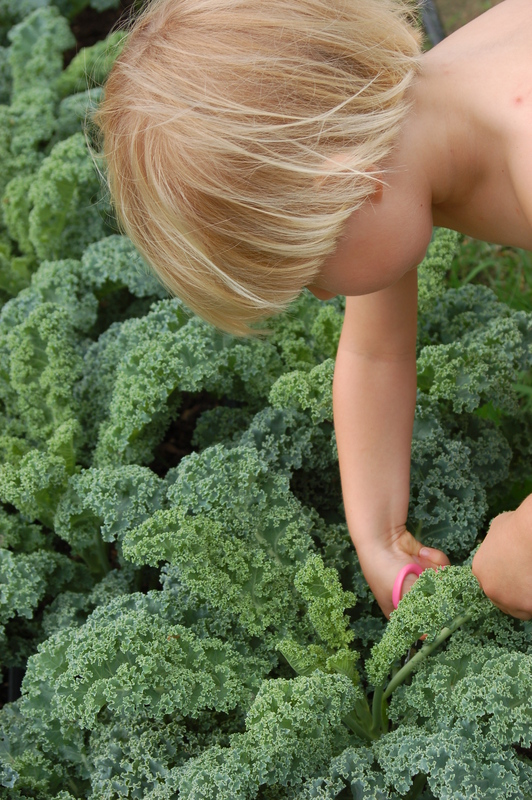 This is a potential answer to small-scale salad greens growing, like we do. There are fine tiny-scale options for cutting greens (scissors in the hands of a person, namely) and there are massive scale options (BIG machines that cut staggering amounts of salad in California each day) but not good options for small-scale commercial operations like ours. Enter smart-teenage-kid. He invented this little rig at the age of 15, in collaboration with Eliot Coleman, had some people built a prototype, had it tested, and Johnny’s Seeds now sells it. We went for it. It made cutting salad mix take a fraction of the time it usually takes. However, the conditions have to be quite precise for it to work. Our second round of trying to use it was a big failure. Jury is, once again, still out. Luckily there are some tried and true, old fashioned methods, too. Like fire. 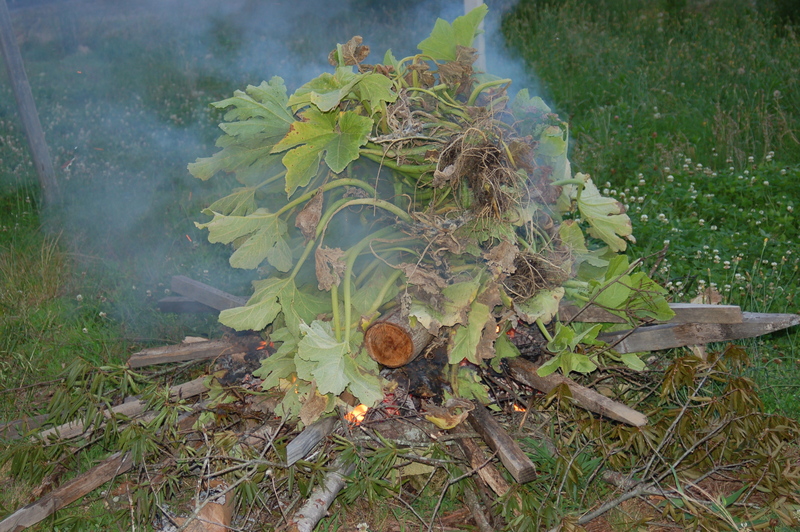 This burned down our first planting of Squash plants – and the associated bugs that plaque us and these plants so much. And scissors. They always work. Beets, Chard, Cabbage (small, traditional heads), Carrots, Cilantro, Collards, Cucumbers (green slicing as well as Salt & Pepper minis), Eggplant, Green Beans, Juicing Greens, Curly Kale, Toscano Kale, Red Russian Kale, Lettuce (green, red or speckled head), Microgreens, Mint, Okra, Peppers (Bell, Padrone, Hugarian Wax, Anaheim), Salad Mix, Scallions, Summer Squash…and Multigrain Bread. Want to Gets Your Hands in This? We have pest-treatment spraying that needs to be done in great quantity, and frequently. Luckily, the process is easily learned and can be done by anyone who can wear a backpack filled with a couple gallons of liquid. If you want to volunteer for a couple of hours of spraying soap on these precious tomato plants, email us. We, the tomatoes, and all Broadfork consumers will Thank You! Options: this Friday, Saturday, Sunday, Monday, Tuesday….